This third – and penultimate – installment continues, once more, where the previous post left off. We’re now heading out of southern New Mexico towards the middle and more northern parts of the state. Bernalillo (NM) north of Albuquerque is not a place where we would have stopped of our own accord. But it’s the town where, after a couple of phone calls to make an appointment, Gregory Cajete offered to meet us for lunch. Greg, who is the Director of Native American Studies at the University of New Mexico and an Associate Professor in the College of Education, is one of the US’s foremost scholars of indigenous education and Native American epistemology and ethics. I wanted to meet him to get his feedback on the “U.S.A. : The Unsustainable State of America” project I’m trying to get into orbit. I had made forays towards other Native American scholars but failed – for the time being, at least – to meet with success. Perhaps my project seems too naïve to them, or perhaps they are wary because it comes from a European researcher (a descendant of the former and current oppressors of their own people) who can be suspect of wanting to instrumentalize all things Native for his own benefit and aura, as has so often been done in the past. As hard as I tried to keep communication lines alive and to demonstrate my sincerity, it didn’t always work, alas. After initial contacts that seemed cordial, e-mails and calls were suddenly no longer returned, for whatever reason; not quite understanding what had gone awry and why, I felt really sad but could do little more to mend the situation. Greg, though, kindly agreed to get together and, things being as they are, I felt a tad nervous and also a trifle too reverential as we entered the “The Range” Café which he had suggested as the place for us to meet. We chatted about university life – its good sides and its disappointments – and we agreed that alternative perspectives on ecology and spirituality are difficult to push through the mainstream academic culture. Greg also concurred with my suggestion that, in a very significant sense, white Western cultures today are in dire need of “development aid” from Indigenous ones. The sense of soul loss and ecological decay is rampant and has deleterious impacts on people’s everyday lives, and although Greg is not one to oversimplify things, he does believe – rightly so (and that’s why I was so eager to meet him) – that Indigenous wisdom will be a key element of any ecology of the future. I realize that many of our modernist colleagues will disagree more or less vehemently; that’s probably because they confuse “indigenous” with archaic or because they know that ancestral epistemologies of the human-nature connection fly in the face of today’s resource extractivism and materialist consumerism. 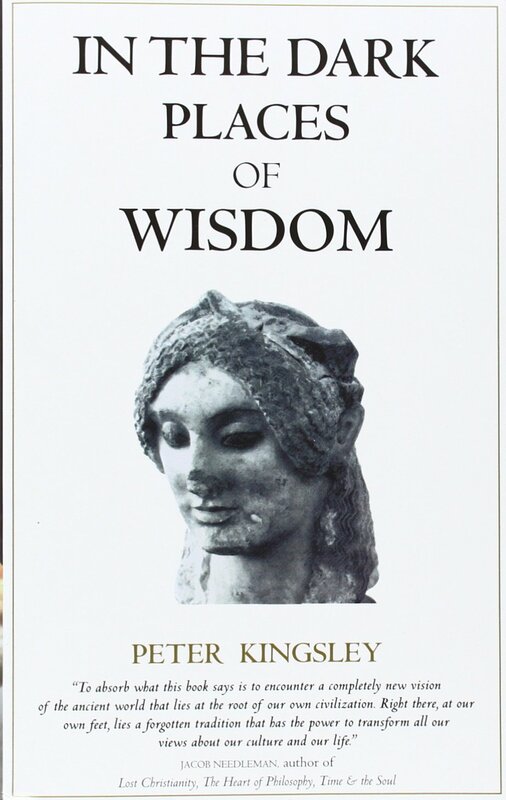 As Kingsley (who has had an honorary professorship at the University of New Mexico, where Cajete also works, and whose work has been discussed by a New Mexico scholar recently) suggests in his latest book A Story Waiting to Pierce You: Mongolia, Tibet and the Destiny of the Western World, Presocratic shamanism was influenced by central-European, Eurasian transmission of shamanistic teachings along the Silk Roads and other ancient paths – and those Eurasian roots are also those of many if not all Native American tribes, so that from the depths of history comes to us the intimation that, very probably, Presocratic wisdom and Native American wisdom have the same distant roots. Kingsley himself suggests as much, and he seems to be onto something. So while, of course, we shouldn’t just be throwing everything together without careful analysis and research (which Kingsley has undertaken, as witnessed by the very abundant endnotes in all of his books), one thing seems clear: The comfortable dichotomy between “us, the Europeans (rooted in the dignity of ancient Greek philosophy)” and “they, the Native Americans (banging on drums and dancing around the fire)” is not only insulting and derogatory, but also false. What about us Anglo and Euro Americans, and us Europeans? 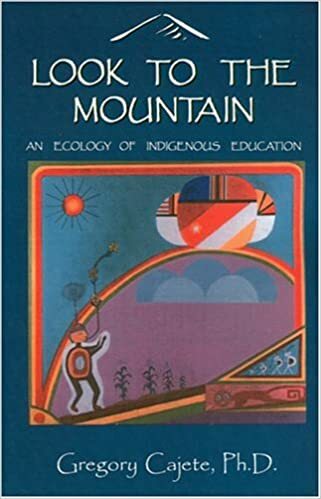 What would our own “Indigenous science education model” look like if it were to integrate long-excluded components of our more ancestral traditions? Aiming for a perma-circular economy and society, we truly cannot dispense with this question and with the – sometimes uneasy – epistemological issues it raises. There is a steadily rising level of interest, in Western populations, for ancient Celtic and other so-called “pagan” traditions which, being pre-Christian and often even pre-Roman, contain perspectives on ecosystems and interdependence whose presuppositions differ profoundly from those of the geosciences and scientific ecology taught at our Western universities. This should be encouraging, even if it’s bound to initially infuriate the promoters of “the scientific method” as a bastion of rationalism from which symbolic thought, mythology and art, as well as other domains of knowledge, are for now excluded. Greg Cajete’s work – as well as that of a handful of others such as the late David Peat (author of Blackfoot Physics) – stands as a beacon for those of us who would breach the divide of cultures and of historical injury and finally recognize that the West, facing the devastating implications of how it has up to now used its “science” and its “technology,” needs the input, critical judgment and assistance of Native cultures more than ever if, to counteract the temptation of using its science and its technology in the destructive ways it has up to now, it is going to rekindle its own ancestral ecological wisdom. The perma-circular horizons opened up by work such as Gregory Cajete’s are essential. He is helping us to envisage a whole new “forest.” He is working out an alternative practice of “deep humanization” through which we can, once more, ask ourselves questions that were obvious to our more distant ancestors, but that modernity has made us forget the answers to. We don’t need “ancient” answers; we don’t need to artificially make ourselves “into Natives.” Wendy Tremaine’s sane reaction to my embarrassingly naïve and misconstrued e-mails (see previous post, section 6) pointed in the exact right direction: reconnecting with the indigenous and the ancestral, we seek and find new answers to, new responses to the challenge of “thinking the highest thought” as contemporary humans. Perma-circularity may, at the most fundamental level, mean pretty much the same thing as it did two or even fifteen centuries ago – our human brains as well as the Earth’s metabolism and equilibria haven’t changed all that much – but the way to realize it is bound to be very different. The contemporary druid and “green wizard” John Michael Greer has written many wonderful books, one of which is entitled – somewhat long-windedly (but look who’s talking…) – Green Wizardry: Conservation, Solar Power, Organic Gardening, and Other Hands-On Skills From the Appropriate Tech Toolkit. In it, he extols the benefits of what Dmitry Orlov, another contemporary member of the “cunning folk,” has called “shrinking the technosphere.” Greer’s and Orlov’s message is that in the face of our technological modernity’s ecological bottlenecks, rationally engineering a sensible “descent” away from today’s overshoot and ecological debt means moving from our veneration of “high tech” to a realistic quest for appropriate technologies. Human communities are likely, in the medium to near term, to need to re-learn more local, less trade- and production-obsessed ways of life, based on a sense of place and on the use of sufficiently simple and modular technologies, so that the need for expensive, professionalized and resource-intensive repair fades into oblivion and so that dependence on large, unmanageable infrastructures such as nationwide power grids or global road or air traffic networks becomes more and more optional. The appropriate-tech movement has many components – from communications technologies to food production to mobility. One of the most interesting ones is the building of alternative housing arrangements that seek to be partly or even totally off the grid (using solar or wind power, or no power at all), that use as many recycled materials as possible and even nothing but recycled materials, that recycle water in a completely closed circuit, and so on. 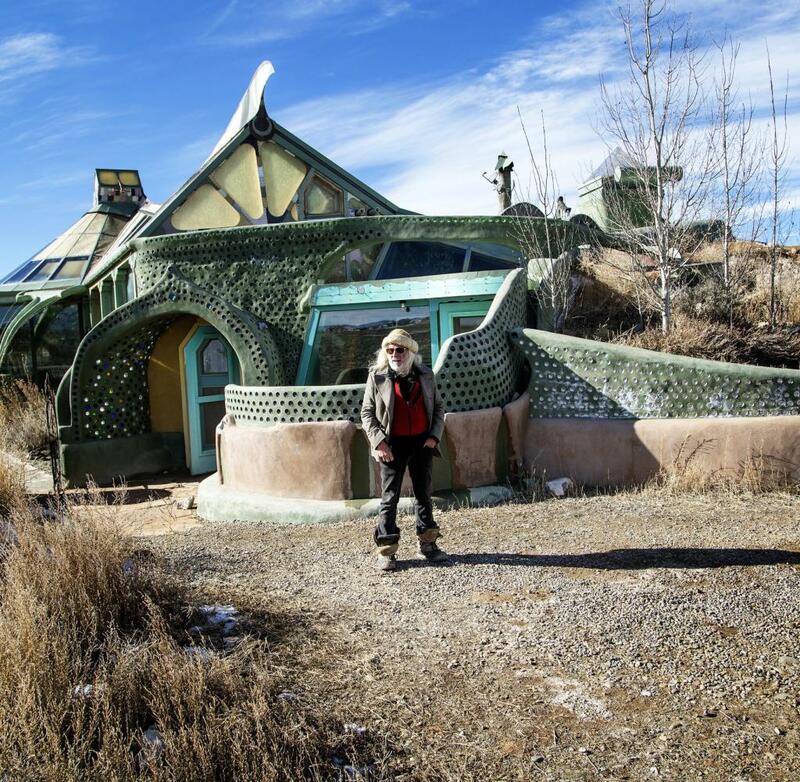 One such pioneering initiative is Earthship Biotecture in El Prado (NM) right outside of Taos, where we went after our visit to Greg Cajete. Taos is beautifully located at the foot of the Sangre de Cristo Mountains in northern New Mexico. Known for being a hangout for hipsters and bobos, it started attracting East Coast urbanites in the 1930s. The most famous of them was Mabel Dodge, a New York City woman who moved to Taos in 1917, started a literary “colony” that received the visits of many famous names (among which D.H. Lawrence, Aldous Huxley, Willa Cather and Georgia O’Keefe), eventually married a local man named Tony Lujan, and wrote several bestsellers about her life in New Mexico, among which the famous Edge of the Taos Desert. We found Taos itself slightly under par compared to its hipster reputation – but on its outskirts we were awestruck by the stunning Rio Grande Gorge Bridge (which floats several hundred feet above a deep canyon along which the Rio Grande is flowing south, away from its headwaters in Colorado), and we paid a fascinating visit to the earthships settlement a few miles west of the gorge. The beauty is gritty, sometimes messy, but definitely striking. 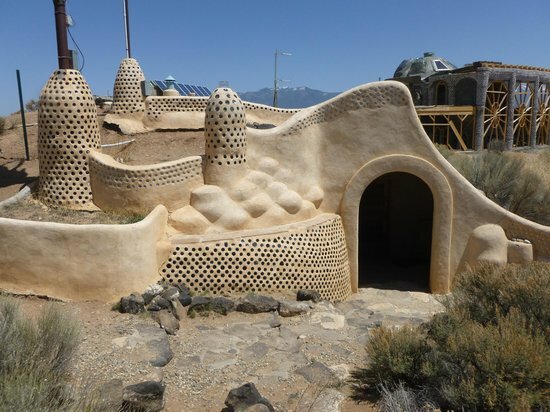 The materials are more malleable than the proverbial brick and concrete and, as result, like cob houses, earthships seem to be primarily molded by the fantasy and creativity of their designers. However, underneath the sometimes quirky outward appearance, earthships are anchored in a genuine science of perma-circularity from which we have a huge lot to learn – much more than from the pharaonic and failed attempts at high-tech, “space age” ventures such as Biosphere 2. 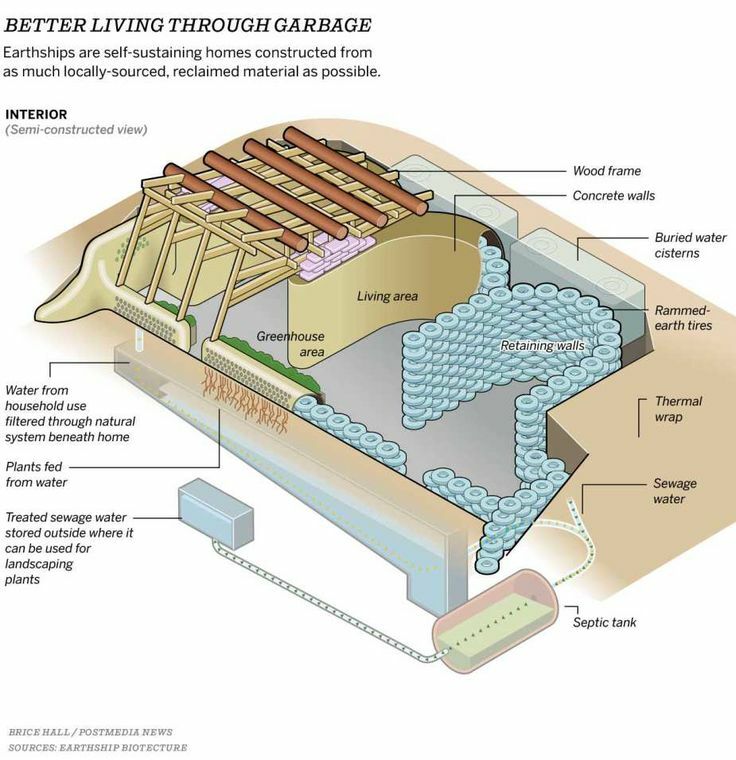 That’s why earthships, which are emphatically not spaceships, are a danger to established moneyed interests vested in space conquest and spatial technologies: Once you’ve visited Earthship Biotecture, the idea that space technologies are somehow necessary in order for humans to learn about closed-loop living is, at best, mildly amusing – and, at worst, frankly grotesque. We don’t need artificial biospheres powered by huge underbellies of water pipelines, electrical connection and fossil fuel supply, designed to house earthlings imprisoned like exiled Martians in the middle of the Arizona desert… All we need – but we need much more of it – is visionary people like Reynolds and his fellow earthship-dwellers to offer us a modest but deeply relevant, appropriate technology of perma-circular building and living. This is exactly what they are doing, and the trilogy of books that Reynolds has published – entitled (you guessed it) Earthship, volumes I (How to Build Your Own), II (Systems and Components) and III (Evolution Beyond Economics) – presents serious scientific evidence as well as empirical techniques for self-construction and for community-building. Indeed, perma-circularity generally isn’t “good business” for those who would like to have rebound effects make their high-tech “innovations” maximally profitable by selling as many units as possible at the highest possible price. 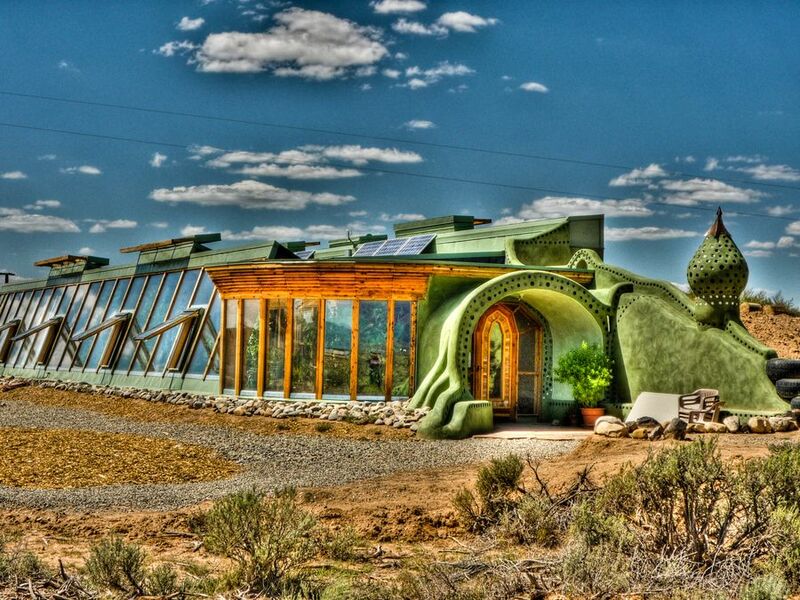 What the Earthship Biotecture adventure shows, however, is that within a perma-circular frame of mind, our very notion of what makes for “good business” has to change fundamentally. Reynolds and his building crew get requests all the time – in the developed world but also in the developing world, including after disasters such as the 2004 tsunami that hit India and Indonesia. They aren’t giving everything away for free, but Reynolds emphatically does not want to become wealthy; he wants to do something meaningful and timely. We didn’t meet him personally when we visited the Taos Earthsip site; it’s quite likely that he has personal flaws and excesses like all of us, but one thing is certain: His determination and vision as well as his realism – like that of Wendy and Mikey on their Truth or Consequences homestead, like that of Greg Cajete in his role as university professor and Indigenous educator and speaker – are beacons of light that those of us who believe in perma-circular ideas and practices can and must look to. Each Earthship will be a “tree” that begins to shift the form and atmosphere of the whole “forest,” one house at a time. In ancient times, life certainly wasn’t easier than now, but it was less destructive of the biosphere as a whole. This is the tenacious feeling – an intuition based on observation – that I harbored when we visited, all too briefly, two historical and still inhabited Pueblo settlements in New Mexico. At Taos Pueblo, the young woman who acted as our guide started out with the exact same caveat: She would not be going into any detail when it came to religion, spirituality or ritual – or, for that matter, worldview and philosophy. We learned a bit from her about the 1680 Pueblo revolt, a valiant though short-lived bout by the indigenous people to repel the Spanish occupiers. The backlash came a little later, and it was ruthlessly brutal – as is the case with all occupying forces. Considering how much Pueblo and other Native populations have been through over the past three and a half centuries (at least), it remains a tribute to their cultural grandeur how peacefully and openly they receive non-Native visitors – who are sometimes ignorant about past catastrophes and occasionally blurt out callous remarks in the most casual way. Inevitably the wounds of history come up in the locals’ narratives (from the Catholic church’s imposition of its “saints” to the attempts by white colonizers to cut off the community’s ancestral rights of access to a nearby lake, its water and its spiritual meaningful landscape), but a strange thing seems to be at work: In order to avoid becoming mere tourist attractions, Àcoma as well as Taos Pueblo inhabitants seem to cultivate a hospitality that doesn’t reduce to a need for money. I may be mistaken in this, and it may just be the wishful thinking of a guilt-ridden, distant descendant of the Europeans that “settled” (i.e. brutally occupied) these parts. But the intensity that floats over the apparent peacefulness of a place like Taos Pueblo in the middle of a sweltering July day may have to do with a particularly Native way of processing the incredible pain of the past – a way that’s neither meek nor bitter, but courageous, dignified and encased in a long-term outlook and a way of inhabiting the Earth of which the Anglo and Euro Americans have no inkling (and which they have routinely interpreted as fatalism and weakness, when it’s just exactly the opposite). I’m not mobilizing the “noble Indian” stereotype as I write this; I am sincerely impressed by that “something” I felt and saw in almost every pair of eyes, even in the least contact-friendly faces. 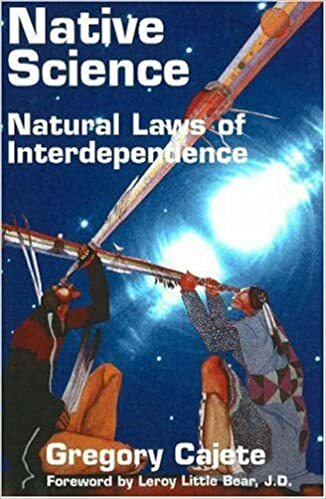 The long-term outlook – what Native American scholars such as Dan Wildcat call the “seventh generation ethic” – also has another striking impact when it comes to my own interest in perma-circular thought- and lifeways. Again, this may just be my imagination, but I had the intense intuition that places like Pueblo Àcoma and Taos Pueblo, while in many ways poverty-stricken due to the segregationist nature of American society towards Native Americans, pretty much reflect what a strictly one-planet life can and should offer. The excursion through the Earthship ethic of self-reliance and radical sustainability drove this home even more intensely. In many ways, these still inhabited “sky cities” of the ancient Pueblo are first-generation Earthship settlements, long before people like Mike Reynolds (re-)disovered radically sustainable building techniques. The streets and lodgings were simple and the Pueblo building technique of using mud, twigs and straw and of adding on “houses” (i.e., extra rooms) as the generations succeed one another – which leads to the characteristic pile-ups of the Pueblo buildings – all point toward radical sustainability. I’m aware that some “development” advocates (even within the Native American communities themselves) might, in the name of progress and wealth, argue that such settlements are nowadays archaic and have long outlived their purpose. It’s true that they are no longer inhabited by more than 100 or 150 people at a time, and that the vast majority of Àcoma as well as Pueblo people live in other, more “mainstream” houses nearby. I’m not arguing in favor of unchosen poverty as a virtue – but I also think that, on the other hand, the choice of simplicity and perma-circular efficiency (as opposed to high-tech, space-age, “Biosphere 2” thinking) is a dire urgency for the whole developed as well as developing world. 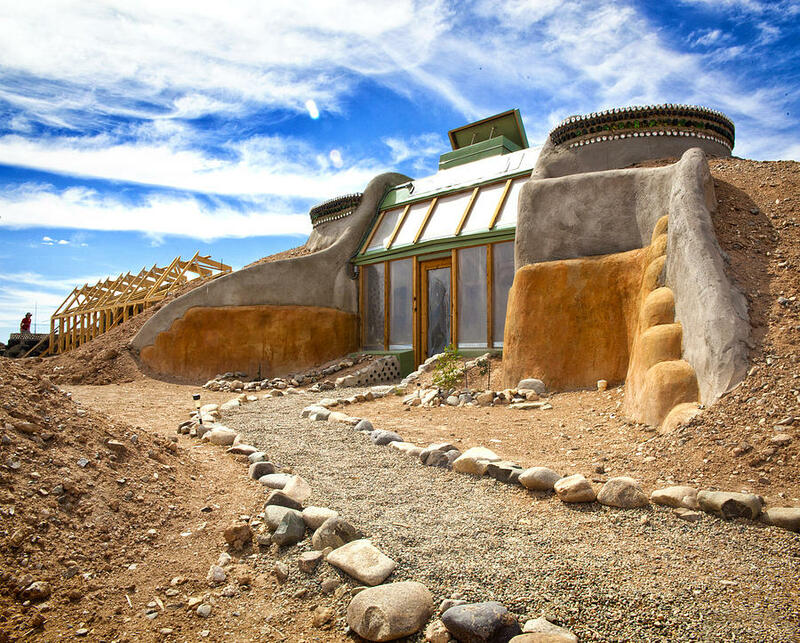 The lessons from traditional Pueblo architecture don’t need to be imposed on anyone – but just like Mike Reynolds’ lessons from Earthship construction, they should be available to anyone for free and open experimentation. This was the meaning of the bill that Reynolds finally managed to get adopted by the New Mexico State legislators: Perma-circular lifeways require perma-circular thoughtways, and those call for the redelpoyment of vernacular architecture and self-construction practices. It’s only be developing safety rules for self-built housing, made with alternative materials and techniques, that vernacular housing can become more common and more widely accepted. Ancient Pueblo houses weren’t built on bureaucratic permits; the whole community pitched in, the “norms” for dwellings were functionally adapted to the climate and the landscape (shade, heat and water are managed, the materials are of a similar hue to the surrounding terrain, the disposition of buildings coheres with the ritual and spiritual needs of the settlement, etc.) and there was a deeply organic growth pattern that kept the Pueblo as an integral part – as opposed to a conqueror and negator – of the surrounding land. Perma-circular settlements in the future, especially in the arid Southwest, might well need to look a lot more like modularized “Pueblos” composed of Earthships, than like Phoenix or Albuquerque’s sprawling subdivisions. Proximity to neighbors and to neghboring settlements, without the possibility of – nor the desire for – connecting into large-scale infrastructures might become the norm rather than the exception. Passing through suburban Bernalillo on our way to having lunch with Greg Cajete, we saw a wonderfully revealing sign that advertised a new subdivision with its homogeneous, power- and water-guzzling pavillions; it read, “Close to everything but your neighbors.” For this Anglo and Euro American mentality, Earthship Pueblos of the future might be a nightmare vision – but they should know better: the Anglo and Euro American worldview of conquest-driven efficiency (relishing rebound effects that make circularity a mere gimmick for more profits and more resource consumption) is quite possibly on its way out, like one more obsolete dinosaur.